My colleagues Elena Mazzotti and Francesca Caminiti recently pointed out that banks collaborating with fintechs can move more rapidly and more effectively than they could on their own to introduce new products, streamline processes, enhance the customer experience and accelerate growth. It is a good time for banks to re-examine their technology strategies and explore the investments and partnerships necessary to get to the next level of digital sophistication. 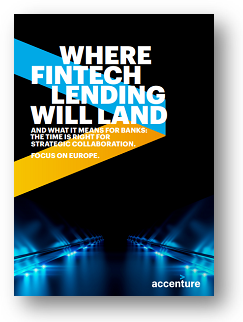 Indeed, Accenture analysis has found that banks’ revenues at risk from fintech competition are typically in the range of two to three percent from lower loan origination, lower net income and fewer customers acquired. On the flip side, banks can gain a potential three to five percent in revenues by collaborating with fintechs, through enhanced customer acquisition, more fee-based revenues, better pricing accuracy and lower cost of risk. Ability to create open, collaborative environments with multiple players. While fintechs are often interested in collaborating (especially since it takes successful fintechs from 8 to 14 years to become profitable), their culture is generally very different from that of banks, and there is a need to create a new common culture—compatible with the current bank culture—to have significant market impact. Avoiding development of a “new legacy” by choosing some fintechs (particularly those providing technology services) that will not scale up to serving multiple players. This pitfall can be avoided by selecting fintechs such as Finastra or Avoloq, which have already been identified by incumbent technology players. Ability to “scale” the “New”. While proofs of concept (PoCs) have flourished over the last two years, we now see the era of innovation labs and digital factories. These initiatives aim in the right direction but are often sub-scale and lack the ability to attract talent, due to limited investments or lack of urgency to scale. Finally, we could take the discussion one step further and question the current focus on “fintechs”. Client journeys are going outside the scope of the purely financial, and relationships could benefit from partnerships between banks and players in other industries such as real estate, health, and education. The focus on fintechs may ultimately prove to be too narrow for banks seeking to enter underserved new markets.